At the end of each summer, sea ice cover in the Arctic Ocean reaches its minimum extent and what is left is what is called the perennial ice cover (mainly thick multi-year ice floes). The area of perennial ice has been steadily decreasing since the satellite record began in 1979, at a rate of about 10 percent per decade. 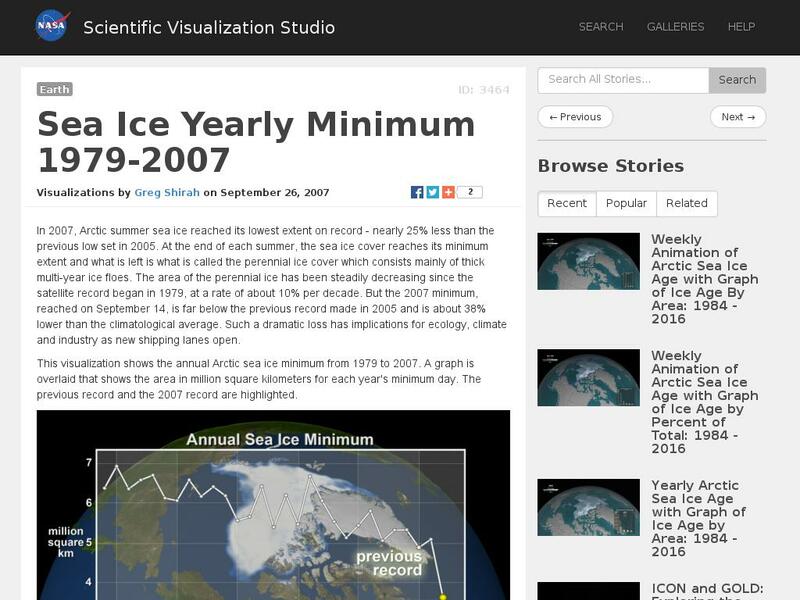 This visualization shows the annual minimum extent of sea ice in the Arctic Ocean from 1979 to 2007. A graph is overlaid that shows the area in millions of square kilometers for each year's minimum day. The previous record minimum (2005) and the new 2007 record minimum, far below the previous record and 38 percent lower than the climatological average, are highlighted. The visualization may be streamed from the website or downloaded in several formats.